For several weeks now, I have been eating oatmeal for breakfast. 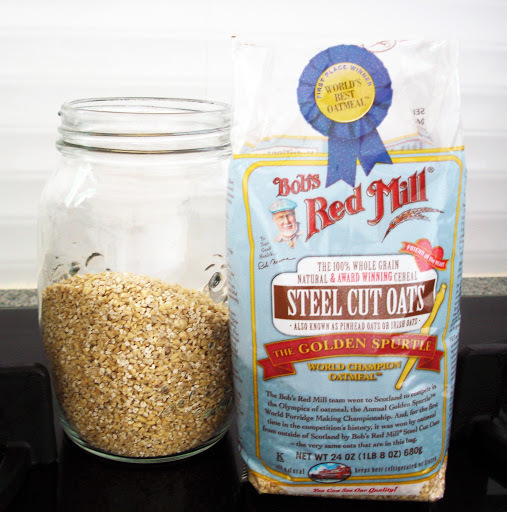 I bought a package of Bob’s Red Mill steel-cut oatmeal and I absolutely love it! I love its texture and nutty taste. I usually make a batch good enough for 6 servings…for the busy mornings of the week. It actually reheats wonderfully in the microwave. It stays chewy and tasty. I put it in a bowl, add the toppings, stir…and I’m done! Easy. 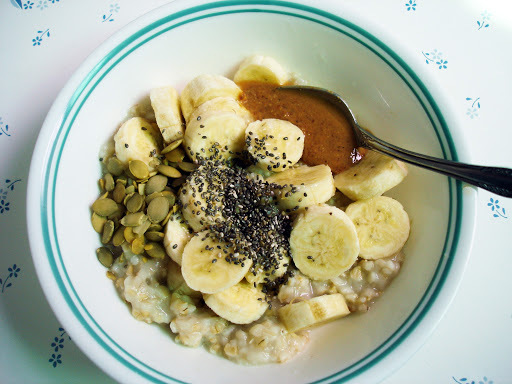 My breakfast last Monday: steel-cut oatmeal with 1 sliced banana, pumpkin seeds, chia seeds, and a teaspoon of almond butter. It’s perfect for days when cooking “tapsilog” is just too much work. I want to eat well, even if I’m short of time. I’m sure you feel the same way, don’t you? 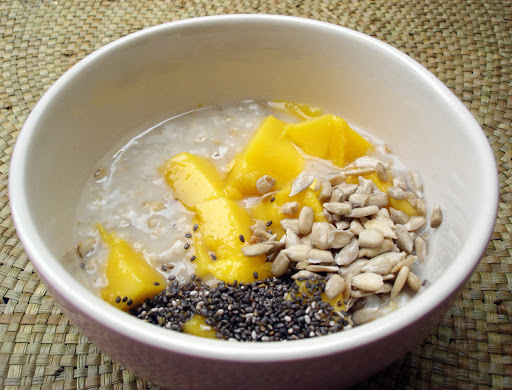 Tuesday breakfast: steel-cut oatmeal, ripe mango cubes, chia seeds, and sunflower seeds. The mango cubes made it sweet and the seeds added a very nice texture. And although many use milk in cooking oatmeal, I only use water. The oatmeal is creamy enough for me. This morning we ran out of steel-cut oatmeal so I opened the box of organic rolled oats that my husband brought home several weeks ago. I have never tried rolled oats before and was quite excited to try some. 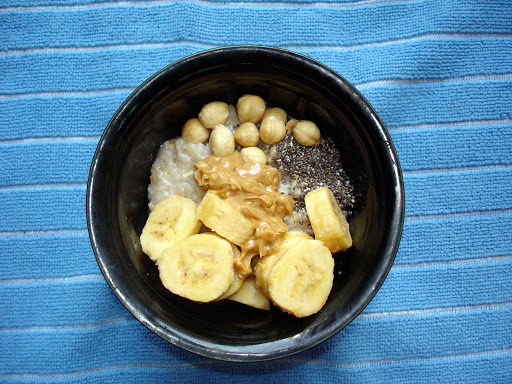 Today’s breakfast: rolled oats, macadamia nuts, chia seeds, 1 sliced banana, and 1 teaspoon of chunky peanut butter. I like my oats a little bit watery but this time I think I cooked it too thick. It was a little dry for my taste. Next time I should add more water. I have posted some of the toppings I’ve tried and I’m still in a hunt for more yummy goodies. I want to try some of our local nuts like pili, peanut, and cashew. I have several kinds of nut butter and I can’t wait to try them all. 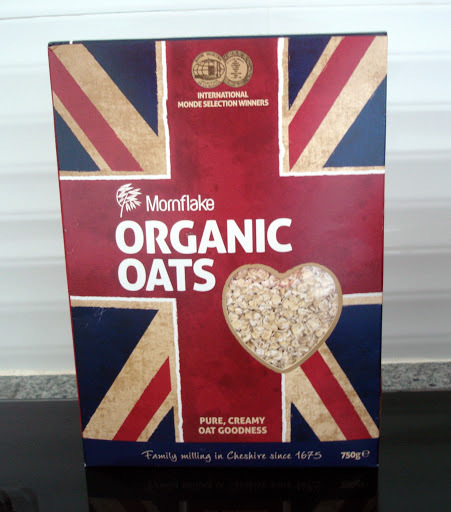 I think I’m beginning to be an oatmeal addict. haha!